The krill in this tank will be visible between 6:15 am and 5:45 pm AEST each day during July 2017. At other times, the latest available video will be visible. Each month, the day length that these krill are exposed to will change, simulating the natural cycle of day length in the Antarctic. Day length has a strong effect on the internal clock that controls Antarctic krill metabolism and reproduction. 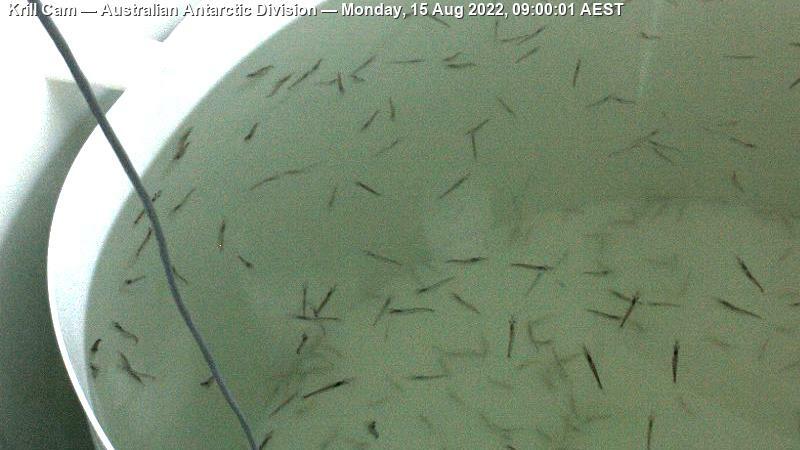 Careful control of day length will ensure these krill spawn in the laboratory at the required time of year. This tank is set to a day length cycle that will induce spawning between September and October 2017, three months earlier than krill in the wild. Eggs collected from this spawn will be used by researchers in laboratory experiments. The krill will be fed phytoplankton six days a week, between 8:00 am and 10:00 pm. The water may appear cloudy until the krill filter the phytoplankton from the water. Come back in a few hours and the tank will be clear again. The circular structure towards the top of the tank is an automatic feeder. The high density of phytoplankton makes the water appear dark. The phytoplankton are slowly released from the feeder during the day to provide the krill with some food at all hours of the day. Antarctic krill is one of the 85 species of krill that lives in the Southern Ocean. This page was last updated on 9 July 2014.